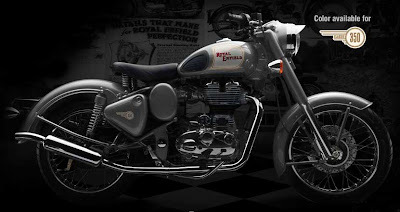 Royal Enfield's recent announcement that it will sell its new Classic motorcycle in India included a look at an interesting new color for the motorcycle. This was pointed out to me by reader Andrew Marsh. The new color is available in India and only on the 350cc Classic. I've posted a picture here. Is it silver? White? I think I will refer to it as the "Gray Ghost." Or, maybe, "London Fog." Marsh is interested in buying a new Royal Enfield, and has started an interesting blog about his quest for a Royal Enfield motorcycle. Among other things, he will have to decide what color he wants. The new color he noticed on the Royal Enfield India web site looks fairly subdued. It is far from the crass silver metal flake on the Honda I once owned. If anything, Gray Ghost looks appropriate for those more conservative days of the early 1950s, when even the picture on your television was black and white. Since it is only on the home market 350, not the 500 we get here in America, we may not seen it soon. We're familiar with the Classic 500 in red, black and teal. I'm still saying black is my favorite color. What's yours? Thanks for punting my blog ;-). Just to let you know I have long decided on the colour of my Enfield, it shall be RED (or is it maroon). The pictures are deceiving. The pics on the Enfield website reflect a definite deep maroon colour. That is what I would like but the "real life" pics seem more red. My local Enfield showroom only has the teal colour. I test rode that bike. It looks great but I think the colour is currently fashionable but might go out of fashion in the near future (IMO). The black is always a good choose but i like to be different hence the choice of red. I must admit when it comes to cars I am inclined to go for silver. So the gray ghost would most certainly grow on me. As for the quest to own an Enfield, why stop at one. Perhaps I should aspire to owning 2. The second one will be an import of a Ghostly Gray 350. Now hows that for being different!!!! I think the grey looks good. I used to dislike grey as a colour for bikes, and didnt think the Nortons in grey looked attractive at all. As Ive got older, Ive come to appreciate the colour a lot more. I like the Bullet in grey!